We’ve been having an unseasonably warm winter in Seattle, which while frustrating for some skiers, has made for some great winter hiking days. This month, try hiking nearby Cedar Butte, a 3.5 mile round trip hike that leaves from Iron Horse State Park, just out at exit 32 on I-90. It starts out as a flat hike on the Iron Horse Trail, followed by a climb of 1,000 vertical feet to some of the best views in the area. Trails around North Bend and the Issaquah Alps, like Mount Si and Rattlesnake Ledge, are notable for their proximity to Seattle and filled with Seattle hikers every day of the week. The Cedar Butte trail offers a less crowded experience. On a recent winter weekend, we drove past the parking lot for Rattlesnake Lake and Rattlesnake Ledge, which was nearly full at 9 a.m., to the lot for the Iron Horse State Park, which had just a handful of cars. Finding the trailhead can be a bit confusing, as it appears a sign is down. From the map board at the parking lot, head to the trail directly opposite, crossing the paved service road. A short walk takes you up to the Iron Horse Trail, a wide flat railroad grade trail, very popular with mountain bikers. Enjoy the flat stroll, and note the signs on the right of the trail - they warn you to stay out, as that side is part of the Cedar River watershed, where most of Seattle gets its fresh water. Instantly, you’re in a whole new world. Just a few steps take you from wide and flat, to a narrow, crooked deer path, meandering upwards through a lush dense forest that feels right out of Jurassic Park. This section of the trail is notable for huge sword ferns and the impressive bright green moss on all the trees, making them look like alien creatures. This time of year, the mist and fog can be thick, giving the forest another worldly air. The climb is moderate, but steady. Halfway up is a fork in the trail: You can take either one, as they will converge again near the very top. The fork on the left is the more direct one - feel free to go up one and down another. The fork on the right takes you to a view of the “Boxley Blowout”, an area deforested in a flood. Either way, continue on to where the trails converge again. After that, it’s a short climb to the summit, which is a treed area with a window to the northeast. 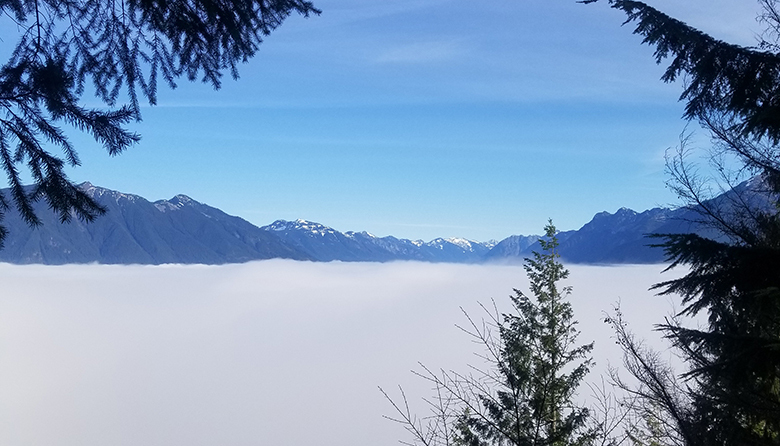 When it’s clear, you can get a nice view of Rattlesnake Mountain, Mount Si and Mailbox Peak, and the Snoqualmie Valley below. Enjoy the view, then head back down, back to your car and home. On your way out, wave to the masses still trying to park in the Rattlesnake Lake lot.